Thousands of experts have contributed to establishing the reality of climate change, despite furious attempts by industry lobbyists to undermine their work. 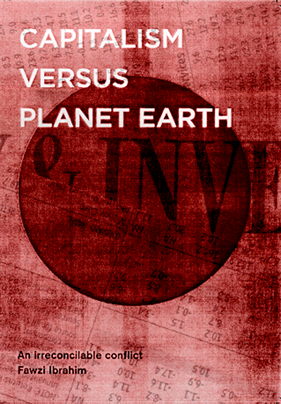 Gerry Gold reviews Capitalism versus Planet Earth by Fawzi Ibrahim. Scientists have at last begun to establish limited statistical associations, evidence pointing to a causal connection between 150 years of industrial production and at least some of the extreme weather events occurring around the globe. This breakthrough is an important rebuff to the powerful corporate lobby. If, however, we have to wait for the mass of empirical observations, the formulation and testing of hypotheses that currently define and limit the scientific method before there can be a general acceptance of the urgent need for action, it is certain to be too late. Fawzi Ibrahim goes further, however, deploying some powerful theoretical weapons learned from electronic engineering and economics, extending beyond the work of the natural scientists. He shows why it is the capitalist system of social relations that necessarily leads to the disruption of the planet’s ecological system and threatens all life on the planet. The importance of Ibrahim’s theoretical explanation cannot be overstated, because it gives us the chance to attack the problem with surgical precision. If you know where the cancer is to be found, and act quickly enough, it can be removed. Throughout the post-war period of credit-led growth in which globalising corporations spread their influence, the prospect of an alternative to capitalist production disappeared from view, hastened by the “end of history” ideology that spread throughout the universities. And the idea that the capitalist economic, social and political system could be the source of the mounting ecological crisis was relatively easy to suppress. This was especially so after the demise of the Soviet Union as a result of the collapse of Stalinism. But now the deepening financial and economic crisis has largely discredited the versions of classical, Keynesian and neo-liberal economics taught to most students. And the worldwide revolt against the consequences of the crisis provides the best chance of building a movement that can bring capitalism to a conclusion and thus provide the solution to its ecological impact. It is in this context that Ibrahim’s boldly titled book Capitalism versus Planet Earth takes on its importance, dusting down, as he admits, conclusions he came to in the 1970s, to inform and help educate an understandably confused new generation. All fall within the confines and restraints of the capitalist mode of production – a system that is incessantly expansive and inherently wasteful; the precise opposite of what is required to combat climate change. Ibrahim’s weapons are two-fold. Firstly, from economics, the discovery by Marx, standing on the shoulders of Adam Smith and David Ricardo, of the law in capitalist society, of the tendency of the rate of profit to fall, which he elaborates in detail. Secondly, using a technique “widely employed in science and engineering”, he explains “how the toxic combination of vast capital accumulation and pressure on the rate of profit to fall inevitably leads the economy towards a ‘critical zone’ in which production for profit becomes unviable”. In the course of developing his argument, Ibrahim challenges the New Economy schools of environmentalists like Herman Daly, Paul Hawken, Jonathon Porritt and David Pearce who want to include “natural capital” in the costs of capitalist production. He argues against those who tell us that the crisis is one of over-population. He also seeks to demolish the typically vapid systems theorists like Nicholas Georgescu-Roegens whose black-box methods are unable to reveal the internal laws of the capitalist system which are responsible for wasteful overproduction and by-products. There are weaknesses in Ibrahim’s treatment of the subject, however. His claim that “so far, there has not been any consideration as to whether it is just a coincidence that the environment is heading towards a tipping point at the same time as capitalism faces a crisis of equally serious dimensions” is overstated. It leaves aside John Bellamy Foster’s Marx’s Ecology, the Bolivian government’s law of the rights of Mother Earth, Polly Higgins campaign on ecocide, and A World to Win’s 2007 publication Running a Temperature to name but a few. His explanation of the current crisis which imposes the “critical zone” theory on to the facts tends to restrict his view. So Ibrahim hardly notices the role of credit in first overcoming but then magnifying the contradictory movement at the core of capitalist society now pushing deeper into recession and slump. And for the future? A wishful combination of self-serving “proletarian professionalism” and a nostalgic view of the not-for-profit NHS of the 1970s is inadequate as a programme for a better society. The overall message, that “a stark choice faces humanity: save the planet and ditch capitalism, or save capitalism and ditch the planet”, may be correct enough, but Ibrahim leaves it to others to work out how to make the right choice into a reality.